Blaz did not speak when Lindear objected to Wild's account of the Parisian struggles. He waited to see what his wife would do with the opposition. Lord Elrond appeared to be on her defense as well, countering the elf lord's questions with his own. It seemed that Glendor and Lindear were not prepared for so many voices against them at once. As he was such old friends with the Kamalli leader, Blaz was not offended by this apparently damaging statement. Radella, herself, chuckled in her sleeve, knowing very well how her husband's humble roots would leave little room for eloquent speech. “There is, my lady,” came a new voice and all heads turned towards the chamber door. Ardis walked forward with her head held high. Though she was dressed in a simple gown, Haidar could make out the colors of their family crest, the crest of Glaskin's House, the royal house of Brunian. Around her waist was her sword belt, a reminder that she was a trained warrior as well as a Lady. At her side walked a second figure. This one walked with a stiff stride, the torchlight glistening off the armor surrounding them. A cloak was set about the shoulders, mocking the robes worn by a king. Upon the head sat a magnificent helm of silver and stone. At the end of the table, the armored figure stopped and glanced up at the Queen. In a swift movement, a hand came from beneath the cloak hem, small, slender fingers pulling the helm back. A red braid tumbled across the warrior's shoulders and a few people gasped. *Note: Her armor is actually silver, but there wasn't an option for that in the doll maker. I better watch my words around those two, she thought, knowing her husband could hear her. I wouldn't trust them if my life depended on them. I'm glad Lord Elrond seems to be a loyal man though. "Lord Elrond is right," she said, glad for the elf Lord's support. "Starving people have a tendency to be grumpy from lack of food and will not always be reasoned with. I can tell you this from first hand experience." Lord Glendor watched her as if he had eaten lemons for breakfast, before turning to the prince with a bow. "What a splendid choice of bride you have made," he said, sarcasm dripping from his every word. "A woman straight from the gutter! I bet she will lead us right into ruin when she one day becomes the Queen." Lord Lindear placed a hand on Glendor's arm. "We can't expect anything better from a halfbreed brat," he said tauntingly. "If he couldn't find a lowly human wife to spread her legs for him, he would have to resort to someone raised among humans... And his mother is not much better..."
Lord Elrond's eyes darkened by the insults flung towards the royal family, and he turned his face towards the Queen and bowed. "My Queen," he said. "If you want me to drag these two nadorhuanrimto the training field and teach them some manners, you only need to say the word..."
Wild listened to Blaz as he spoke of the alliance between elves and humans, glad that he was treating both races equally. She smiled at his choice of words, and through the corner of her eyes she could see Queen Radella smiling as well. Her smile widened when Lord Haidar gently teased Blaz for his choice of words, and she placed a loving hand on her husband's arms as Haidar pointed out King Thanos's humble origins. "My husband's blunt words are only a part of his charm," she said as she kissed her husband's cheek. "Each and every one of his traits only makes him more endearing to me... I will rather listen to the blunt and honest words of a humble man, than the eloquent lies of a snake." She threw Lindear and Glendor a glance as she said this, making it clear who she felt the snakes were in this case. The two elf lords glared back at her, not even attempting to hide their dislike for her. She listened with interest when Lord Haidar spoke of someone that could claim the throne of Brunian. The words about the blood of Lord Haidar's mother would have confused her if she had not remembered the conversation at Eldarion's failed engagement party - Lord Haidar's mystical words that had been interrupted by the Queen. She realized that there was a story here she did not yet know, but promised herself to ask Blaz about it when they were alone. This was not the time or the place, especially not with Glendor and Lindear present. When Ardis entered the room, Wild smiled by the sight of her sister. The girl looked as lovely as ever, wearing a dress she had never seen before. But Wild thought it suited her well. She would have asked if Ardis was the heir, but then she noticed the second figure at her side. She remembered the girl being introduced as Ailsa - the girl young Eldarion had fallen in love with and wished to be his wife - and she also remembered how Lady Elrond had reacted when she found out who the girl was. Wild, however, had no issues with this young girl who had been so kind to her orphans, and she offered the girl an encouraging smile. The two elf lords Lindear and Glendor watched the interruption with poorly hidden impatience, watching Lady Ardis and the girl by her side as they entered the room. "What is a maidservant doing at this meeting?" Lord Glendor snapped, recognizing the girl from the Queen's staff. He had often demanded humiliating chores from her himself, and he knew that Lindear's family also did their best to torment the girl. Both elf lords snapped when they heard the girl introducing herself. Lord Lindear rose to his feet, his face almost purple with anger. "I protest against letting a child of the Dark King on the throne," he snapped. "Who is to say that she won't be as evil as her father? No - I suggest that we kill them both - before more evil can spread!" Blaz discretely put his hand on his wife's knee as she shared her concerns with him through thought. It is good to be wary of them, but do not back down. This is the challenge that they have needed ever since my father died. Mother has a good heart, but she is too lenient with them. I can't blame her because she was stretched thin due to the war, but this is a chance to get them back in their place. As Ailsa removed her helm, she placed it on the table before her. In part, it was a symbolic gesture of peace, but also to free her from the extra weight. The girl had rare spent time in garments so heavy as this armor and feared that her discomfort would soon show. Her eyes stayed on the open seat next to the Queen as the angry shouts from the elf lords rang across the room, staring the empty air down as she would if Hibernia was berating her for forgetting her chores. Ailsa's eyes snapped over to Lindear as the fat elf lumbered to his feet, the shade of his plump face almost as dark as her armor. She could see hellfire in his eyes and almost feel the spit coming from his frothing mouth. As the suggestion of death was passed down, she could hear low murmurs among the council. Was this the end already? Looking to Ardis in fear, she could see the woman's steely gaze and knew that aggression would be the only route. Feeling Blaz's hand on her knee she smiled as she heard his thoughts in her mind. Her eyes sparkled with mirth as he asked her not to back down from the challenge of the elf lords. Your sweet mother has been nothing but kind to me from the moment I came, and I love her as much as I love my own parents, Wild told her husband. If it is a challenge they need to start treating her with the respect she deserves, I will be glad to give it to them. I admit though, that I do not have your skills of politics. Teach me how to get them back in their place, and I will be glad to challenge them in any way you wish. I know that you and I can win over these two if we work together! Even if Wild didn't care about Glendor's sarcasm towards her, it warmed her heart to hear how her beloved Elf Prince protected her against Glendor's poisonous words. "Speaking of support of the people," she said softly. "Has anyone made lists of what our people need at the moment? If not, I am willing to help out. I may not know everything about Brunian and Isparia yet, but I will learn with time, and I do have connections that may be able to get us what we need to rebuild our Kingdoms." Lord Glendor's face turned bright red as the Prince spoke out to defend his wife, calling his children sorry. The fat Lord felt both his double cheeks tremble in anger, and his eyes narrowed dangerously. But before he could throw an insult back at the elf prince, the Queen rose from her chair and spoke. Lord Elrond nodded in understanding when the Queen spoke, remaining by her side to support her if the other elf Lords dared to insult her again. But he removed his hand from the hilt of his sword as a token of respect for his Queen. "It will be as your Majesty wishes," he said, then lowered his voice so only she could hear. "Your husband Thanos would have been proud if he could see you today..."
Lord Glendor and Lindear turned bright red when the Queen reminded them that they were here as a courtecy to their families and that they would be returned to their cells if they did not behave. Their face expressions looked like they had been forced to eat a truckload of lemons, but they managed to reply in a (for them) polite tone. "We understand, your Majesty," Lord Lindear replied with a face expression that Wild would remember with malicious glee in many years to come. The Mirion Princess looked casual, but her hands squeezed Radella's under the table, and the thoughts she sent the Queen were filled with joy. Splendid words, Mother - I am so PROUD of you! They deserved every word you said! Knowing how Ailsa felt in front of the Royal Council, Wild sent the girl a look of sympathy and tried to mentally transfer some of her own strength and courage to her. She knew how hard it was to carry garments like these for the first time and guessed she was probably already feeling tired. 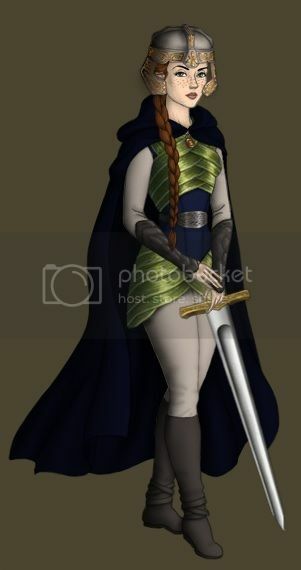 The Elf Lords glared when Ailsa were introduced as the rightful Queen of Brunian. "Says who?" snorted Lindear. "Everyone knows that the Dark King spread his seeds all over the land. How are we to know she really was Queen Neasa's daughter, and not just a simple imposter?" Lord Glendor pipped up as he heard Lord Lindear's words. "Yes, we want proof that she is who she claims to be," he said, certain that such proof could not be found. When Lindear's fat shape hoovered over Ailsa and Wild noticed how scared the young girl was, the Mirion Princess rose to her feet. Swiftly she moved across the floor, draping her arm gently around the girl's shoulder. She was not afraid of the furious elf Lord, as she knew her royal husband would protect her if Lindear was foolish enough to try to hurt her. "I agree that an apology is in order, Lord Haidar," she said as she moved Ailsa out of Lord Lindear's reach. "But she should not be standing on the floor like a mere servant when she receives it..."
Taking Ailsa's hand in hers she led the girl gently towards the empty chair next to the Queen and placed her on it. Then she gave her a kiss on both cheeks - a token that the Mirion Princess saw herself as an equal to the Princess of Brunian. Then, with a smile she turned around, her dark eyes sparkled with mirth as she eyed the two dumbstruck elf lords. "Now they can apologize," she said, a smile playing around her mouth as she returned to her husband's side. Reaching for a pouch at her side, she drew out a silver chain. On the chain was a signet ring bearing the crest of the royal house. The small shield divided into four pieces, the background colored in silver and cobalt. At the top was an eagle, settled on a nest and peering out with watchful eyes. Below was a hound, much more wild than those that occupy a farmer's home, yet elegant and strong. To the sides were two serpents, each twisted around in unending bundles, guardians of the others. Waiting for the elf lord's reply, she noticed movement at the top of the table. All eyes watched as Wild stepped towards the red-haired woman. Ardis smiled at her sister as the elf princess wrapped an arm around Ailsa's shoulders and lead her to the top of the table. As she passed the Queen, Ailsa lowered her gaze, knowing the betrayal that she had held for so many years. Even if the Queen would not speak of it, the girl knew that her choice of secrecy would have lasting consequences. Sitting down with a nervous glance at the faces now watching her, Ailsa let out a long, slow sigh. Being seated by the Queen, farthest from the door, was more nerve-wracking than standing alone. She would have a more difficult time escaping now if swords were drawn. Wild's face lit up in a smile when Radella pointed out she had compe upon an issue none of the elf lords had considered. She placed a loving kiss on the Queen's cheek when she was called daughter, her smile growing when she was allowed to work with Lord Haidar. Turning towards Ardis's brother she offered a light bow, a token of respect and friendship. "I am glad to work with Lord Haidar, mother," she smiled. "If he doesn't mind me sticking my nose in his business. He knows much more about the Human lands than I do, so I am glad for his help to do this task. I know I will be safe with him and his men. I will do my best not to get too much in the way of your work..."
Lord Elrond smiled when the Queen spoke so warmly of her husband and his legacy. "We are all in debt to King Thanos the Wise for what he did for our Kingdom," he said warmly. "And as I promised him then, I will work to protect his Legacy as well as his family." The elf lords Glendor and Lindear saw how Ailsa's body shook as the legitimacy of her birthright was challenged. They watched in silence as Ailsa drew out a silver chain from a pouch at her side. They saw the chain with the signet ring, studying it closely to make certain it wasn't a fraud. "It is real," Lord Lindear confirmed, then turned to Ailsa with a sly expression on his face. "But what guarantees do we have that this is not stolen? Do you have other proof?" Lord Glendor watched Ailsa and added to Lindear's words. "We have only seen you as a maidservant in the Queen's house," he added maliciously. "We all know that servants have long fingers that may snag things that do not belong to them..."
The Mirion princess met her sister's gaze as she wrapped an arm around Ailsa's shoulder and gave her a gentle wink as she led Ailsa to the top of the table. She knew very well that nobody would dare to draw their swords near the Queen, as it would be seen as an act of treason and all the guards at the Queen's house would come rushing to the Queen's aide. There were few other places where Ailsa would be safer than she was on the chair next to the Queen. She gave Ailsa an encouraging smile as the girl nervously sat down, and then she turned to Lord Haidar with a smile. "Well, Mylord," she said as she sat down next to Blaz again. "I think you wished two elf lords to apologize to the Princess? Now is a good moment to do so, don't you think?" She looked at the two elf lords glaring at her with beet red faces and could practically swear she saw steam coming out of their ears. "I will never apologize to that... imposter!" Lord Lindear snapped. "Me neither!" Lord Glendor barked. Wild sighed and turned her face to Lord Haidar, a devilish glimpse of humor in her eyes when she met his gaze. She knew how angered he must be for this treatment of his cousin, and assumed he longed to kick their butts. "Lord Haidar," she said, putting on a sinister face expression to hide the laughter in her voice, a laughter that came from the image forming in her mind of the two elf Lords getting their butts whacked. "These two elf lords seem unwilling to do as I ask them. As the Commander of the Army I appeal to you - will you please make them apologize to the Princess for tainting her honor with slander?" Haidar smiled as Wild spoke of working with his men. "I know better than to refuse the bride of the Prince," he chuckled. "I have no secrets from my family and friends. I am glad to have a representative of the elvish people in our efforts. It will show the Human Lands that the Fair Folk still have hearts and are not the creation of old wives' tales." Seeing the royal token that Ailsa presented as proof of her blood, Haidar could see the skeptic looks of Lindear and Glendor. In their chaotic world, it was possible for such a relic to be stolen. However, the commander knew of a sure way to determine Ailsa's words. "If you doubt her word, you can ask the Queen to test her for falsehood," he suggested. "You know that she can determine a person's lies by examining their minds." Radella's eyes darted in his direction, a suspicion in them that made him aware that he was on thin ice. Little did he know, the Queen had already examined Ailsa before she came to work at the palace as a servant. Her bloodline was already known and hidden during the war. The leak of such information would put Ailsa and the royal house in danger. "I would have no objections to this," the elf queen said finally, "if the Lords think it a necessary proof." Despite the kindness of Wild's gesture to Ailsa by placing her at the Queen's side, Haidar could feel the nose tightening around his neck. Unless information was given in a very specific way, they would have a civil war on their hands. The sanctuary of Ailsa was unknown to the people of Isparia for seven years . . . seven years of deceit. He knew that hotheads like Lindear and Glendor would explode once they learned the Dark King's daughter was living among them all that time, a wolf among the sheep as they saw it. It would be very tricky to clear the Queen of all blame and keep the aide to the Human Lands still flowing. As Wild turned to him for help with the Lords' refusal of an apology, Haidar was running through all the scenarios he could think of. The hand had to be played very carefully and he was the first to put down his cards. The future of his people was at stake . . . their home in Isparia, his friends, his child, Isabella . . .
"I cannot refuse a wish of the Princess," he said slowly, hoping the pace of his words was seen as weight and not the nerves that it truly was. "I do agree that the Lords have stepped over their bounds and an apology must be given. I urge them to do so without hesitation or I will be forced to do something verydrastic!" Wild was glad that Haidar did not mind her working with him and his men to improve the living conditions for the people in the Human Lands. "It is easy to sit here in meetings and make plans for the people," she said softly. "But the only way to find out what they really need is to go to them and ask them. And you know your people well and know which ones I should ask." Lindear and Glendor still looked skeptical when Lord Haidar suggested they could turn to the Queen and ask her to test Ailsa for falsehood. Then they nodded. "If her Majesty would be so kind," they finally said and bowed to the Queen. "Our Queen has never been known to break her word." The Mirion Princess realized how Lord Haidar and Queen Radella would soon be endangered if Lindear and Glendor should explode by findind out that the Dark King's daughter had been living among them for so many years. And yet she had never made any attempts to threaten their lives even if she could very well have done so several times. Did that not show that she was not cruel like her father? She decided to point this out to the elf lords if they made attempts to attack the girl - unwilling to leave her friends to face their enemies alone. If things should go very wrong, she knew that Ailsa would be safe in Uncle Thorn's fortress, or with Mir's allies in the two Kingdoms East and West. But we don't need to send her there yet, she thought. First she will get a chance to fight and claim her throne back. And I will help her as far as I can - since I will be in her situation the day I challenge Morg. She was glad to have Lord Haidar's help to force the elf Lords to apologize to Ailsa, smiling as he spoke of drastic measurements if they refused. She decided to help him a bit, remembering the horrors she had experienced in the orphanage. "Isn't it true, Captain, that in times of revolution food and warm blankets become scarce in prison cells?" Her words seemed to have an impact on the elf lords, who only moments before had been threatened by the Queen to be returned to their prison cells if this meeting got out of hand. Knowing that the Queen never broke a promise they reluctantly knelt in front of Ailsa's chair. "Please accept our sincere apologies, Princess," they said, throwing nervous glances in direction of the Queen. Radella nodded her head slowly when the elves asked for proof of Ailsa's birthright. Looking at the red-haired girl, the elf smiled softly. Ailsa closed her eyes and waited for the test to begin. She hoped the elf queen would not be angry with her about the situation she had created. Moments later she felt the soft tug of another mind against her own and lowered her defenses. My lady, forgive me! she begged at once. I knew no other way. If I am going to defeat my father, I must have the aide of your people . . .
Hush, child, answered the elf. Calm your mind. You are beginning to shake and I do not want to give the council doubt of your intent. I must say that I feel ambushed by this brazen show. Who put you up to this act? Ailsa paused, but the Queen could sense her unease. Lord Haidar and Lady Ardis, my Queen, she answered softly. They said that I must show my strength if I was going to gain followers. I wish to be a leader but I am not a warrior like them. Seated at the Queen's side, Ailsa felt nervous as the elf lords approached her chair. When the knelt at her feet, she fought back a look of shock. She had spent so long in the lie of a servant, she had forgotten what royalty was treated like. When they spoke, she could tell that it was under duress and not genuinely for her. This angered her more than their accusations of falsehood. Wild watched in silence from her place next to Blaz as the Queen tested Ailsa's mind. She knew her Mother had probably tested the girl before taking her into her service when she first arrived here, but if the royal court wasn't smart enough to figure out this for themselves, she was certainly not going to help them. Instead she rested her head on Blaz's shoulder while she waited for the results of the test. Lindear and Glendor looked displeased when they learned that this was indeed the child of Queen Neasa and King Ulric. "Are you saying that a child of the Dark King has lived among us for so long?" Lindear exploded, his face red with anger. Lord Elrond placed a heavy hand on his shoulder and held him back when it looked like Lindear wished to physically attack the girl. "If the girl had wanted to harm us she could have done so several times already during her stay here," he pointed out. "The fact that we are all still alive and the City is still in the safe hands of our beloved Queen proves that the girl is nothing like her father." Wild's dark eyes measured Ailsa from head to toe, though her face expression was far more friendly than the two elf lords. "As you all know, I have seen more darkness from the humans than most of you," she said softly. "And I can assure you that I see nothing of this evil when I see Ailsa. I keep hearing that Queen Neasa was a kind and gentle soul. I believe this Princess has inherited her mother's gentle spirit." As soon as the two elf lords had apologized to Ailsa they rose to their feet again. Lord Elrond placed himself between them and the girl to keep her safe from attacks. He smiled when the girl apologized for allowing her father's demonic reign to continue beyond what it should have. He shook his head when she blamed herself for her father's actions. "Don't be too hard on yourself, little Princess," he said. "From what I understand you are still merely a child, and there is little a child can do to stop the heartless one. I am glad you managed to escape before he got the chance to kill you, as I know he would have if you threatened his power." He turned towards the Queen and bowed when Ailsa asked the council for support to take back her family honor and the throne of Brunian. "As a member of the Council I vote for supporting the young Princess," he said. "She is still young, but her heart has not the evil we have seen with her father." Lord Lindear spoke up from his place, still upset and beet red. "But there is no guarantee that the madness will not spread from within her mind later!" Ailsa looked at the Queen in regret when Lindear put the pieces of her past together. She was glad that some of the elves appeared friendly, one by the name of Elrond, defending her and holding his angry kinsmen back. "He speaks the truth, my lord," she added. "I came to your land as a refugee and nothing more. I did not hide my royal blood from the Queen as I no longer wish my title. Yet, we are not here to discuss the past but the future. I have committed no crime that I could prevent." The additional words of the Princess Wildfeather gave Ailsa more confidence that the distrust will be quelled. The voting began and it appeared successful until Lindear spoke up again. "Enough!" shouted Haidar, slamming his fist upon the table. "Enough of this show! I will not stand by as my people are mocked, while my blood is being challenged. There are innocent people dying by the numbers in our land and all you can do is mock the only chance they have for freedom. You may have the lavish lifestyle of kings, but you are nothing more than thieves to rob those people of help. If Queen Radella cannot quell your voices, I will have no choice but to find my aid elsewhere and lead the Kamalli away from your ill schemes." This threat made the entire hall silent. There was a moment of hesitation, each person wanting to speak but not knowing how to follow. Finally, there was a soft voice from the Queen's right. "The Kamalli were born in this city, by our elven hand," said Blaz, his silver eyes watching his old friend with disbelief. "What gives you the right to lay claim on their fate?" "As the only son of Lord Morven and Lady Adila, the leaders of the Kamalli clan . . . I have the only right . . ."
Lindear and Glendor still fumed in rage when Ailsa declared she spoke the truth and that she had committed no crime she could prevent. In the good old days they would have easily gathered support from the other highborns, but something seemed to have changed when they had been locked away in the dungeons. The council members who earlier had listened all too willingly to the two elf lords seemed now to turn to Lord Elrond instead, waiting to hear his opinion. Lord Elrond also noticed this change and (secretly) enjoyed it. Not for his own sake, but for the sake of the Queen. When he spoke to support the Queen in the Council meetings he hoped to get her the support she needed to carry out her plans for their people. He knew that she too wished happiness for all the people in both Kingdoms, and he would do what he could to help. He had promised King Thanos to look after his family, and Lord Elrond intended to keep his promise. "Of course you have committed no crime, child," he told Ailsa gently, in the same tone he used when he spoke to his own children. "We know who the real criminal is, and it would be highly unfair to punish you for something he did." There was a brief intermesso where Lindear and Glendor protested against his words and Lord Haidar exploded in anger and threatened to lead the Kamalli away from Isparia if help to the people was not given soon. Lord Lindear and Glendor paled when they heard these words. They seemed almost shocked that most of the elves - even the highborn ones now voted in the Queen's favor. One of the Elders stood up from his chair when the matter was settled. "The Royal Council has voted, and we have decided to give the Kingdoms of Brunian and Isparia all the aide they need to recover from the wars." Wild listened to the Royal council with a smile, clearly pleased with the results. She looked at Blaz as if she wondered what Lord Elrond had done to the Council members to make them change their tune - but she said nothing, as she did not wish this sudden acceptance to be withdrawn. "Excellent," she replied, sending the Queen an apologetic smile for being the first to speak after the vote had been made. "From Lord Haidar's words it seems the people of Brunian is in dire need of help, and I wish to start my work right away if you will allow me. I have lists to make and resources to order so the people will not suffer for longer than they have to." She had not finished her sentence before Maurice came rushing into the room with excitement written all over his face. "The merchants from the Kingdom of East has arrived," he announced. "And they bring with them even MORE gifts for the people than the Kingdom of West did!" The tension in the room was felt after Haidar had laid down the threat to Lindear and Glendor. The commander watched the crowd with his piercing eyes, looking for signs of protest or weakness. The challenge by Blaz was expected and Haidar knew that his old friend would have words with him about it later. To the great relief of all, including Haidar, the council rallied against the elf lords and granted aide to the Human Lands. As the council dispersed, the commander lowered his head and offered a quiet thank-you to the Ancients. Ailsa was about to answer when she caught sight of Haidar watching her from his spot at the table. The commander looked more terrified than he had that morning. She was going to point this out to his sister when they heard a voice from the other side of the room. “We should leave,” Ardis advised and quickly dragged the princess off to her room to change. In the hall, Haidar did not hide his surprise from the elf prince, but stood tall as he walked over to the royal seats. Radella had remained at her son's side, but did not speak. Sensing that he would not gain any allies, Haidar softened his shoulders and looked at Blaz with pity. “You know I had no other choice,” he began but the flare of Blaz's nostrils warned him of silence. “I could not stand by and allow them to berate Ailsa,” growled Haidar, his face beginning to redden. Drawing his angry eyes away from Haidar, he kissed his mother's hand before lead Wild out of the room. Like everyone else in the room, also Wild felt the tension after Haidar had laid down the threat to Lindear and Glendor. The only difference was that the others in the room seemed to understand why the tension was there, while Wild did not know the persons involved. The elf girl looked at her husband, a silent plead that he would explain to her when they were alone. She was relieved to learn that the council decided to send aide to the Human lands, and she looked up at Queen Radella's face to see if this was what she had wanted too. Wild wished to help because she knew how it felt to starve and lack anything - experience she had gathered in her harsh years at the orphanage. Overhearing the Queen's conversation with Ailsa about Eldarion she was glad to hear that Ailsa and Eldarion were still together - even if she felt sorry for Lady Asaliea for losing a son because of this. She hoped that things could be mended over time, and that mother and son one day would be able to reunite as a family. Perhaps Lady Asaliea even one day would find a way to accept Ailsa as her daughter-in-law? But she knew it would be a big step for the woman to forgive a child of the man who once had killed her father. "I wish the best for you and Eldarion as well," she said softly to the young Princess. "And I hope to see more of you in the years to come. I am certain you and I will become good friends - it could be useful to both our Kingdoms, don't you agree?" She smiled and kissed the Queen's cheek as Ailsa and Ardis left the room. "Thank you for supporting Ailsa from you-know-who, Mother," she whispered. "The rest of the council is not all bad, but I feared for the fight I knew Lindear and Glendor would put up if they got a chance. I only wonder what Lord Elrond did to them to make them agree with him like they did." The Mirion Princess stood by the side of her husband as the others left the meeting. She had not been told to leave and took it as a sign that her husband needed her to stay with him at the moment. She listened in silence as Blaz had words with the young Kamalli Lord. Since she did not know all the history behind, and the only person she had heard of was Blaz's father, she did not say anything. She wanted to see the whole picture before forming an opinion. When Blaz lead her out of the room, Wild followed him without protesting. Only when they were alone did she finally speak. Draping her arms lovingly around his neck, she snuggled into his arms in an attempt to ease his anger with her endless love for him. "Do you have time to explain to me why everyone were so tense during the meeting, my love?" she requested gently. "Even if I am your wife, I am still a stranger here - unfamiliar with Lord Haidar's parents and this Glaskin, whoever he was. Your father is more familiar to me, as he since our marriage is also my father. What is the cause of your anger, my beloved husband? Please tell me, and also tell me what I can do to make your wonderful smile return to your face again..."
In the Council room, Maurice stood behind with a look of confusion clear on his face as everyone left. He had noticed the tension between Lord Haidar and Prince Blaz, even if he did not understand the reason for it. In the corner of his eye he saw little Yvette bouncing into the room and dragging her Daddy away, and he was alone with the Queen. "Whoa, everyone seem so tense today," he said as he wrapped his arms around the Queen and placed a loving kiss on her cheek - the way the orphans used to greet the Queen every time they met her. "I hope it was nothing I have done... or any of my little group of charges. I am sorry if I interrupt anything important - but there are a group of merchants from the Kingdom of East here, and they ask to speak to the Queen of Isparia. From what I understand they bring you gifts from the Kingdom of East as a thank you for saving Princess Wild from certain death." Leading Wild away, Blaz could tell that the princess was very confused by what had happened. While he was still seething with anger and disappointment, the touch of his bride and her soft words mellowed his mind. He kissed her forehead and lead her to a nearby window. Below they could see the marketplace, bustling with shoppers and merchants. The wagons from Mir were there, overwhelmed with the curious citizens inquiring to their strange wares. Wild smiled when Ailsa thanked her for coming to her defense. "We princesses have to stick together against snobs like Lindear and Glendor," she smiled and patted Ailsa's arm gently. "Perhaps one day it is you who defend me against someone like them. I am certain you and I will get a chance to know each other in the years to come - especially since the council has decided to aide your people, and I was chosen to talk to your people and find out what they need." She blushed when Ailsa complimented Blaz for his choice of bride. "Thank you," she said softly. "I think Eldarion made a wise choice of bride as well, even if his mother seems to disagree with me. But you have many who support you, so don't worry about that. I am certain everything will end well." When she heard how Lord Elrond had wore down the council member with persistence, the Mirion Princess grinned broadly. "It was a smart weapon from the looks of it," she cooed. "And effective too - as they agreed to send aide to Brunian. I am glad they did though - I want to help the poor people who are still suffering after the war. As soon as I can, I will go to Brunian and see if I can find someone to talk to - and who will be able to tell me what the people need. If nobody can say anything, the only way to find out is to walk among the people and see for myself what they need the most." Noticing how the two elf lords grew beet red with anger by the Queen's mentioning of their cheating, her smile grew even more. "It was not the smartest thing to do - swear on their honor not to cheat before the duel, and then cheat when they are about to lose. It will tell the people that they have no honor - even if some of us knew this before the duel started..."
Blaz's kiss on her forehead brought a smile to her face, and she followed him to the nearby window so he could explain to her the story of the Kamalli. Even if she was a Kamalli herself some of the Kamalli history was still a mystery to her. So she was grateful that her husband took the time to sit down with her and respond to all her questions. From the window where they sat she could see the merchants from the Kingdom of East. East was a Kingdom of Mountains, and some of the things they brought with them were fine and rare materials like jewels, silver and gold. They also brought with them marble and other materials for use when houses were built. Wild smiled when she saw it, as she knew it could come in handy when they rebuilt Brunian and Isparia after the war. The girl nodded when Blaz said he was a half-breed. He had told her this when they first met, and they had found out how similar they were. She was also a half-breed - of two different elven races. Thus she could understand the pain Blaz felt when someone asked him to choose between the elves and the Kamalli. "I can understand your pain when this question was asked, my love," she said softly and kissed his cheek. "I agree with your choice of staying with your mother. You are her only child, and she would suffer without you. If any such choice must be made, I will choose to stay with you. It is true I am a Kamalli, but I am also your wife, and my place is with you." She perked her ears in interest when Blaz spoke of the mysterious Glaskin. "I have heard his name mentioned a few times before," she said. "I hear he has no elven blood in his veins, nor is he a Kamalli. How did he become such a famous man? Except from being the father of the Dark King of course. People speak of him with such respect that I think he must have done something else besides siring two children." She nodded in deep thought when Blaz spoke of Haidar never being the true leader of the Kamalli clan. "Yes, it would be some sort of confusion if all Kamalli's of the world would have to answer to one leader only," she mused. "Not to mention the practical problems with traveling through portals to get to the leader. The world is a great place. Traveling the human lands can be hard enough if we are not going to bring in the rituals that needs to be done to go through the portals to our Elven realms." She smiled and kissed her husband's lips softly when he asked if he had replied to her questions. "Thank you, my love," she said softly. "It helps a lot to have a sweet and kind husband to ask when there is something I wonder about. I have other questions too, but they are about the Human lands. I understand that the people there are suffering? How soon will we be able to travel there and tend to their needs?" In the council room Maurice was relieved to know he had done nothing wrong. His face lit up in a smile when Radella spoke of his skills as a healer. "Thank you, My Queen," he replied politely. "Since Lady Eileen adopted me as her son we have tried to sneak in lessons in medicine and first-aid every day, when I am not busy with my weapon training or the school lessons with Miss Isabella..."
"I came here for three reasons today, My Queen," Maurice said to chase away the thoughts of Miss Isabella before the other boys noticed the tiny pink hearts swirling around his head and started to tease him. "The first reason is that the merchants from the Kingdom of East has brought you presents and humbly asks to meet you. The second reason is that the boys and I wondered if we could have our Kamalli Test one day when you are not too busy. And the third reason was simply that I missed you." When the young elf couple was alone, Blaz could feel his anger slipping away. The arrival of the traders from Mir was a blessing to his people, the promise of a more prosperous future. The Queen noticed the sigh on the boy's lips as he spoke of school, wondering what the boy was thinking of. Yet she would not ask as matters of the mind were often private. Wild patted Ailsa's hand comforting when she spoke of Eldarion giving up his entire world to be with her. "I am certain you two will be happy together," she smiled. "Getting to know you, I can understand what he sees in you, and I am certain he doesn't think of giving up his world for you as a sacrifice." Alone with Blaz Wild was glad to see his anger slipping away. Resting her head against his chest she watched the merchants on the ground, smiling when she saw the people gathering around them to find out what they brought this time. She listened when Blaz spoke of the argument with Haidar, glad that he realized the young lord did not mean harm by his words. "I know he is Ardis's older brother," she said. "But I don't know how much older he is. Ardis is a year older than me, I think, but I didn't dare to ask Lord Haidar of his age. I feared it would be seen as rude, and I don't want to step on anyone's toes if I can avoid it. I agree it would be silly to abandon the alliance of our people and the Kamalli. Such bonds could be useful if the world again turns to war." The story of Glasking was interesting, and she could understand why the man had been so respected among his kind. "I am sad to hear he had to see his kingdom falling to the darkness of his son," she said softly. "I hope there will be a way to stop it now that young Ailsa has stepped forwards to claim the throne. She seems like a nice young woman, and my little orphans speak warmly of her. Obviously she has been very kind and helpful to them. Clearly she does not share her father's madness yet." Her eyes filled with compassion when she heard of the ones of their kind afraid of getting involved in the battle of feared leaving their homes. "Our poor people," she said softly. "Hopefully we will be able to give them a new start, a life without fear, and no fear of starving again. I know we can build up our Kingdoms again - as long as we do it together." A smile lit up her face when Blaz told her to journey to the Human Lands to find out the needs of the people, and she kissed her husband gently. "I will go as soon as Lord Haidar is ready," she promised. "The sooner we can start giving aide, the less lives will be lost because of starvation and disease. At the orphanage we always had shortage of food, clean water, clothes, blankets and medicines. Would I be terribly wrong to assume this will be what the humans need most of all as well?" Her eyes sparkled when she heard how Ailsa needed to prove herself flawless without doubt to win over the people. "I have no doubt that she will make it," she said softly. "She seems like a fine young woman, and I have faith in her. And do not forget that Eldarion will be by her side and support her, just like you and I support each other." Maurice smiled shyly when the Queen praised him for taking on so much responsibility. He had always been a hard worker, as nobody at the orphanage had been allowed to develop lazy manners. "My foot has been healing nicely thanks to you, Milady," he said, pulling off his boot and showing her his foot so she could see for herself. "I don't know what spells you said when you looked at it, but as you can see for yourself they worked perfectly. I am in your debt for healing me so fast. Yesterday Oliver and I raced each other to the training field, and I won!" Maurice smiled when he realized the Queen had noticed the sigh on his lips. Meeting his gaze he could see she was wondering, and he leaned forwards and kissed her cheek like a loving son would kiss his mother. "I can tell you my secret," he told her quietly. "As I know you will not tell anyone. I have a very secret crush on Miss Isabella - but I won't tell her, as I know young Yvette wants her to be with Lord Haidar. Besides, I realize that I am only 11 and would probably be too young for her. But I enjoy being near her and admiring her beauty in silence." He nodded when Radella promised to visit the merchants as soon as they were done. "They will appreciate that, Milady," he said. "From what I could understand they had brought you a present from our allies in the Kingdom of East - the Kingdom that lies East of Mir." The boy beamed when the Queen agreed to test the boys for the Gift. "I am the oldest one," he said. "So I can be the first. When I am done, I can go and fetch Oliver for you - then you can test Paul and Simon afterwards." Kissing her forehead, he lead Wild back to their room and helped her gather the supplies needed for her journey. After many kisses and intimate caresses, he lead her stables to saddle a horse and pack the saddle bags. Wild smiled when Blaz told him of Haidar's age. And Ardis told me she was only a baby when she came to Isparia," she mused, furrowing her eyebrow in thought as she tried to do the math. "That means he is no more than 7 years older than her. Since Ardis is one year older than me, Lord Haidar will be 8 years older than I am, is that correct? I will be 17 years old on my next birthday. I am a winter child, born in the worst snow storm Mir has ever seen. I think Lord Haidar would be around... 24 years now? 25? You are better at math than I am." When Blaz told the story of the first meeting between Blaz and Ardis, Wild smiled as she pictured the scene before her eyes. She could picture her and Blaz's children soiling their clothes with hay and mud one day too, just like little Haidar had done. "Poor little Haidar," she laughed. "First he gets in trouble for soiling his clothes, and on top of that he has to share his parents with a baby sister, after being their little prince for 7 years. How did he take it?" She listened as Blaz spoke of Ailsa as the new leader of the Human Lands and nodded in agreement. "If any ruler would know of their hardships and fears and meet them with love and understanding it's her," she said. "I don't think they will get a better leader anywhere else. The King has proven his worthless since we now see how the people are starving and freezing, succumbing to various diseases. I told you that my mother was a healer, right? She used to dread such states, as they often lead to epidemics and mass death." Her eyes filled with tears of compassion when Blaz told her of how their kin in the human villages were hunted for fun. "Oh those poor dears," she exclaimed. "There must be a way for us to help them. I want them to live good lives free of fear, a life where they are surrounded by love and happiness. I don't want them to suffer from lack of food or medicines or warm clothes to shelter them from the weather. Perhaps we could write to the King of East and ask him for building materials to help these poor souls rebuilding their homes? What do you think, my love?" She nodded when Blaz spoke of how the people needed guidance and assurance that the war was over. "I will keep open my connection to you, my love," she said softly. "Then you can be with me in spirit and guide me with your wisdom so we can help these people in the best ways possible. I don't fear their hostility. I know very well I was not exactly an angel myself when I lived in Paris - not after what I had been through. It was only your love that helped me heal from my shaded past." After gathering the supplies from her room and sharing a wonderful and intimate moment with Blaz, she was ready to start her mission. Blaz was sweet to follow her to the stables to saddle a horse and help her packing the saddle bags. Once they were ready, she gave her husband a last passionate kiss before climbing onto her saddle. "I will come home as soon as I am done," she promised her husband. "And I will keep our connection open so you can communicate with me through thoughts whenever you miss me. That way you can also hear what they tell me and see through the visions I send you what I see. Please look after your mother and the children when I am gone. I feel a bit better when I know they are safe with you." At the marketplace Eldarion had bought the supplies his beloved Ailsa had asked of him, and he had also gotten a couple beautiful horses that were grassing peacefully nearby while he waited for the Council meeting to end. He felt a bit nervous staying here, knowing that most of his people did not yet know that he had left them. Only his father knew at the meeting, and father would not tell anyone unless it was forced out of him. But he knew that if he did, his people would realize he had left them. He trusted that Lord Haidar would protect his cousin in Eldarion's place. He seemed like a good man, and Eldarion liked him. In the Queen's house Maurice showed off his mended foot with pride, allowing the Queen to touch so she could feel for herself that there no longer were broken bones or open wounds. The scars that remained were so small that they could hardly be seen, and the healer had told him that these scars would soon go away too. "It is thanks to you and Mother Eileen, Your Majesty," Maurice said as he hugged the Queen tightly, kissing her cheek again. "I will never be able to repay you for your kindness to me and the other children. We all love you with all our hearts and will spend the rest of our lives protecting you from harm." Seeing the sparkles in the Queen's eyes, Maurice knew that his secret was safe with her and that the other children would never find out. He already knew what relentless teasing would come out of this if Paul and Oliver found out. Much less he wanted Lord Haidar to find out, as he understood from Yvette's stories that the Kamalli Lord also liked Miss Isabella. The Queen's kind and caring words helped him feel a bit better, and he smiled when she said his time would come. "I don't know if I can call it love," he admitted to the Queen. "I just think she is pretty and is proud that she wants to speak to me... But I hope to experience a love one day when I am grown. The Prince and Wild seem to be very happy together, so I hope I will be able to make my love just as happy..."
When the Queen offered him to sit closer to her, he moved over to the offered chair. On her request he emptied his mind and placed his hand in Radella's. When he felt ready to begin, he offered the Queen a gentle nod. Alisa had changed back in to her plain dress after the meeting. While she knew it was a discomfort she would have to get used to, the armor had been a relief to remove. Once she had freshened up, she and Ardis went to the marketplace to find Eldarion. The vendors took more notice of the auburn-haired girl and Ailsa wondered if the news of her identity had traveled that quickly. Thankfully, no one bothered them (perhaps due to Ardis's presence) and they could make their way to the location that Eldarion was scheduled to meet them at. Taking Maurice's hands, Radella slowly peeked into his mind. She was gentle, allowing him to identify her mental touch and familiarize himself with her presence. When she felt he was content, she drifted deeper into his memories. She was glad to see that many of his feelings since arriving in Isparia had been happy. She could see how much his wisdom and leadership had contributed to his life, both in her realm and in Paris. The orphanage scenes were hard to see, even if she had seen them in the minds of the other children. When she saw how he had injured his leg, the elf's hands shook and she retreated for a moment back to the happy memories. Despite his terrible conditions, she could still see glimpses of laughter and love in the boy's time at the orphanage. The good feelings were exclusively contributed to the children and Wild. Wild nodded when Blaz reminded her that she was an elf. Having lived among humans for so many years had often made her forget that - but now that she was with Blaz she had started remembering again. It felt lovely to speak her own language - not French - to someone who understood and who replied back in the same language. She had noticed that the children had adopted the language here in Isparia as well, and they got help from all their new friends and families when they struggled with words. "It saddens me to think of our human friends not living for as long as we do, my love," she said, snuggling into the arms of her husband. "I will cherish every moment we can share with them and remember them fondly when they are gone. I also plan on spoiling the children for as long as I can. I hope you won't mind... They are children only for a short time before they grow up. I will spoil our own children the same way when they are born." She laughed when she heard Haidar's first words about Ardis. "Poor little boy," she grinned. "It is not fun to have to share parents with someone. But I am glad he changed his opinion later. On our wedding day before he walked her down the aisle he told her he would die to protect her. I think they are very fond of each other now, like siblings should be." Wild listened to Blaz when he spoke of the help they needed to rebuild the villages. "Perhaps it would be wise to bring some of the orphans with us when we go there?" she asked. "If they see us with the children they can't think of us as monsters, can they? Charlotte loves all the Kamalli and will not be afraid to be seen with any of them. Paul is not afraid of strangers either." When he spoke of the rebuilding she thought for a moment. "At the orphanage Paul, Oliver and Maurice did all the maintenance work, and they have experience from building houses - including roofs," she said. "I am sure they won't mind helping if someone ask them to. The girls can knit and sew and do the work needed inside the houses. Even Simon has experience with building work - he held Maurice's tools for him when Maurice was working." At the stables she hold on to Blaz's hand and caressed him gently when he spoke of missing her. "I will miss you too, my love," she said softly. "I know I will be safe with Haidar and Eldarion, but I will miss you even so. But I know you are working on getting supplies for our travel to Mir at the end of the week, and doing research before our journey." Her face lit up, and she leaned down to whisper in Blaz's ear. "One of the merchants from Mir is named Jandar. I have known him since I was a baby. Do you still have the pouch I gave you? The one made by my mother? Show it to him, and he will know I have sent you and tell you everything you want to know about Mir. I think he is still with the merchants at the house your mother allowed them to stay in when they are here." Eldarion's face lit up in a big smile when he saw Ailsa's beautiful face again, and when she threw herself in his arms he wrapped his own arms around her and kissed her passionately. "I am glad to see you are safe," he told her. "I have worried for you all day. How did the meeting go?" His face showed relief when Ailsa said that the council had agreed to help them. "Praise the Ancients," he said and let out a sigh of relief. "I was a bit nervous there. I was almost certain that Lindear and Glendor would try to cause problems." He showed her the bags of supplies so she could see the content. "As you can see for yourself I have bought us food and supplies to last for a while, and also some medical herbs in case we get sick or injured. I have also got us a couple of horses who are at the stables and will be ready to follow us when we decide to leave. What are the plans now that the meeting is over?" Maurice smiled and hugged the Queen. "I feel much more at ease here in Isparia with you and the kids and all our new friends," he said. "I know the others feel the same, and we will do anything you wish for if there is something we can do for you in return. None of us are afraid of hard work. I heard something about houses that needed to be rebuilt, and I know a bit about tools and how to use them." The boy smiled when the Queen told him that this was how love began, nodding when the Queen spoke of his love for Wild and the other orphans. "Well, they are the only family I've ever known - before I came here of course," he said. "After I came here, I included also you, Prince Blaz, Evan, Ardis, Haidar, Master Slafin and Lady Eileen in my family. And now Miss Isabella of course. I have many persons to love and protect." He smiled when he saw his first meeting with Wild. She was 5 years old - a sad and miserable little heap of rags and with tousled braids that had just arrived. Her princess gown had been stolen from her by the people who sold her to the orphanage. When she arrived supper had been served - and the other children had stolen her food from her before she got the chance to eat. Maurice had only been 6 months old at the time - sitting on the floor near Master's chair and waiting for him to drop some of his food down on the floor. Master was a sloppy eater, so Maurice used to get lucky now and then. This time he had got hold of a sausage and a slice of bacon. Inside the young boy's consciousness, the elven queen searched for traces of The Gift. As with the other children, the animal could take on many forms and locating them could be challenging. After the experience of the orphanage, many of the children had become secretive and stealth, not opening up to others in a direct manner. The Queen was lucky to gain the trust of the children, but the animal guardians . . . well, they would be another story. As she looked at his memories, Radella could feel the presence of an animal spirit in the background. The spirit was swift and light in it's movements, darting around so that she could never get a full glimpse of it. The presence of eyes were always on her consciousness, watchful and calculating. The elf smiled – she knew that feeling from her own animal form. You have done well to protect your human, she said softly. He has grown strong and wise. I know that you still linger in the dark of his past, but his future is bright and hopeful. He would like to meet you if you are willing. She could feel the eyes fade away and she was alone again. Hoping that her message had been accepted, Radella retreated to her own body and opened her deep brown eyes. She smiled at Maurice, wondering if he had felt what she had. Wild listened to Blaz when he spoke of the burden of a long life. She was glad she had married an elf so she wouldn't have to suffer the pain of losing her love after only a few years of marriage. The day he died, she would die with him. But first they had to secure the thrones of Mir and Isparia with heirs and raise their children and prepare them to become good Kings or Queens for their thrones. "I know I will cry the day we are forced to see our human friends die from us," she said, her eyes brimming with tears by the thought. "I have grown so fond of them, and I don't want to lose them. I will do what I can to give them a better life just like you do. I want them to be happy and free." She nodded when Blaz told her about Haidar's work to keep the truth of Ardis's blood a secret for so many years. It touched her how he protected her. "He seems like a good man," she smiled. "I am glad to learn of this, then I know that little Yvette has landed in a good home where she will be treated well. She is the most vulnerable of the children - the one that is in strongest need of protection. Her cheerful facade is only a mask to hide how easy it is to hurt her." When Blaz spoke about the trip to the human lands being a political trip, Wild nodded in understanding. She feared that Paul and Charlotte might get bored and run off on adventure and what could happen to them if they did. "You are right, my love," she said and kissed his cheek. "Perhaps we can bring them another time, if their new families are willing to let them." She mused for a moment before she continued. "What dangers can we expect on this outing?" she asked. "I wish to be mentally prepared before it happens so I can stay alert. I hope Ailsa will be accepted as their Princess like she was meant to be. She seems like a good girl - and I can't see any dangers coming to the people from her hand." She was glad that Blaz would speak to the merchant Jandar when she was gone, knowing the old merchant would be able to answer all Blaz's eventual questions about Mir. She looked around to see if Lord Haidar had arrived yet. She knew that also Ailsa and Eldarion would travel with them. "It seems we are the first ones to arrive," she said softly to her husband. "But I don't think we will have to wait for long. I hear hooves nearby. Please take care of yourself when I am gone. I will miss you." Eldarion enjoyed his reunion with Ailsa, holding her in her arms as if he never wished to let her go again and kissing her passionately. He listened when she spoke of how terrified she had been at the meeting and cradled her in his arms. "My poor love," he said softly. "If only I could have been there to protect you." He laughed when she said not even his mother could have scared her so. "I bet she would be insulted to hear that," he grinned. "Shall we go and say it to her face?" He caressed her hair gently when she spoke of dying at the hands of a sword. "Nobody will be allowed to use a sword against you as long as I am alive and can protect you, my love," he said softly. He was not the least surprised to hear that the elf lords caused problems. "I am glad Lord Haidar was there to protect you," he said softly. "I hope my father did not cause any problems for you as well..."
He smiled when Ailsa said they were to meet him tonight for the journey to the Human Lands. Then his purchase of supplies had not been in vain after all. "I hope the journey will be a lucky one for you, my love," he said softly. "I will be by your side all the time so nobody can hurt you." A grin washed over his face when Ailsa asked if anyone at the market had asked questions about the large purchase. "Well, they did ask," he admitted with a grin. "But they stopped asking when I said I only followed Lord Haidar's orders. If I had said I followed your orders it would only have lead to more questions. Clearly they are used to soldiers gathering supplies before a trip. I hope Lord Haidar is prepared to answer their questions the next time he goes shopping." He saw a monastery, a nun kneeling in front of the statue of Virgin Mary and praying. She was sweating while she prayed, wiping beads of sweat from her forehead. Only when the prayer was over and she stood up, did Maurice notice the baby bulk on her stomach. The woman was clearly in labor, and now she walked inside a dark corridor away from the rooms were the other nuns were working at the moment. Biting on a piece of wood to hide her screams of pain, the nun gave birth to a baby boy. The birth was long and painful, and she had to rest for a long time before she was able to get back up on her feet. After smuggling the newborn child to her cell to wash it and cut the cord, she wrapped him into a blanket and carried him to the gate of the monastery, where a monk in dark robes waited for her. It was obvious that these two knew each other very well, for they kissed passionately when they met each other. Then she placed the baby boy in his arms. Maurice saw the man's eyes gleam with pride and joy for a moment, and he felt a strong man's hands caressing the top of his head. "I wish there was a way for us to keep him," the man said. The woman sighed. "You know how strict my Mother Superior is," she whispered. "I don't dare risk it. The last nun to sin with a monk was whipped until she died from the wounds. Please - take him away before I change my mind and keep him with me forever..."
The man nodded and turned away to leave with the baby in his arms. As they left, Maurice could hear the nun crying bitterly behind him. The monk carried the child to a little house in the outskirts of Paris - where a kind woman with silvery hair took care of him. His first months were happy, the old woman gave him love and support, and fed him properly with milk. But one day she died, and the other villagers could not afford to support one more hungry mouth. Maurice was picked up and carried to the slum area, where he was left at the orphanage. Perhaps it would have been the end of him, but on his first day there a tiny 5 year old child arrived - a little elf girl with pointy ears. She looked so miserable that the baby sent her a broad, toothless smile to cheer her up. This was the beginning of the long friendship with Wild - a friendship that would last to the end of their days. Maurice smiled when he learned of his first meeting with his elven friend and protector, glad that they had been able to support each other through the times of darkness. While he closed his eyes, he could hear the Queen speaking to his animal spirit. The boy's heart raced with excitement. Did he have one? And what kind of animal was it? He heard a hooting sound and flapping of wings, then an owl appeared in front of him and landed on his shoulder, looking at him with wise eyes that shimmered in brown and gold. The two exchanged a farewell in Elvish before Blaz returned to the Queen's house and Haidar joined Wild at the meeting place. Ailsa and Eldarion followed behind, both looking fresh-faced and eager. The princess had chosen to dress in a traveling gown, her sword secured on her hip. Apart from a circlet of silver given to her by Radella, she had no traces of her royal birth. Radella could feel Maurice's excitement as his earliest memories came into view. She followed in silence as he entered the monastery, watching the prayers of the young woman. The birth of the child was painful to witness, the elf woman wishing she could comfort the innocent mother, yet there was no way through the memories. All she could do was stand at Maurice's side and hold his hand. As the boy was given to his father, the Queen felt a stir in her heart. The moment, while tragic in it's ending, was tender and beautiful. It was a moment all mothers remember, the first time their love sees the child they created together. Wild was glad to learn that her human friends would appreciate knowing her for as long as they could, and snuggled against her husband's hand when he wiped the tears from her eyes. "But you won't die from me, will you?" she asked softly. "I don't think I can live without you. I love you so much..."
She listened when Blaz told her of the dangers she might expect on her first journey to the Human Lands and nodded in understanding. It was not very different from what she had seen in Paris and she understood she should be just as cautious on this journey. "I will do what I can to help," she said softly. "And in the areas we have to leave, I hope to at least find someone who will wish to contact us when they are ready to be helped." As the hoof beats grew louder, she caressed her husband's face when he kissed her hand. "I will be careful, my love," she said softly and kissed him one last time. "And counting the seconds until I can be in your arms again. Take good care of our children when I'm gone. I know little Charlotte will ask for me." With a sigh she reluctantly released his hand, her loving gaze resting on his well-formed shape as he walked away. She waited patiently when he spoke to Lord Haidar, smiling when she heard his request that his bride was returned to him intact. When Lord Haidar, Ailsa and Eldarion finally joined her, she greeted them with a smile. Since this was a political journey she was dressed in an elven-style traveling gown, showing she was here representing her people. Also she was wearing a circlet, the jewels on it formed with Blaz's family weapon to show she was married to the Prince of Isparia. In addition to that she was also carrying her wedding ring, the one Blaz had given her on the day of their wedding. "You look beautiful," she told Ailsa when she saw her. "I will be very surprised if your people refuse to accept you as their Queen." Eldarion caressed his beloved Ailsa when she looked at him with wide eyes, kissing her gently. "I am only teasing, my love," he told her gently. "I would never put you in such danger as to face my mother's wrath. You are my only love, and I don't want to lose you." He smiled when he heard how his father had behaved at the meeting, glad that the elder man had not tried to cause problems for Ailsa. "My father and King Thanos were best friends," he said with pride. "He was the first to support the King towards the naysayers among the elven people. He will not hesitate to cross swords with anyone that tries to hurt the Royal family." His years at the orphanage were too painful for him to live through again, and he forced himself out of the dream when Queen Radella had been able to get in touch with his animal spirit. 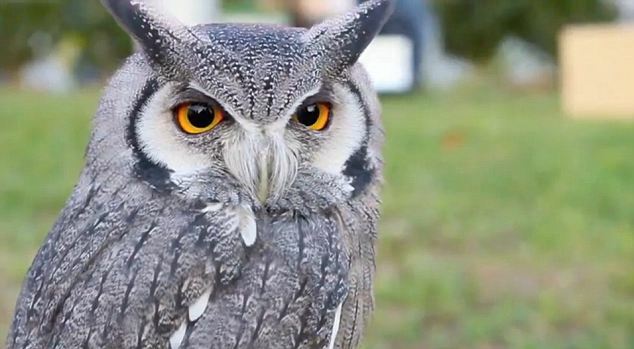 A smile formed on his lips when he opened his eyes and found the owl sitting on his shoulder. Reaching out his hand, he gently petted the owl's feathers. "Hello there," he said softly. "My name is Maurice, and I am pleased to finally meet you. Thank you for looking after me and guiding me for as long as you have. I am sorry I could not make your watch easier."